In April, after a lot of hard work, the Jim Savage-Lowden Observatory was officially opened by his widow and children. Regular observing sessions began, and an up to date Sky Sensor Computer was purchased. As a Society, the regular observers among us were managing to get together to view astronomical events – weather permitting – and show interested members of the public these events on a regular basis. 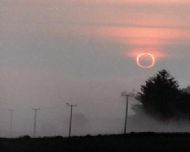 We observed the Mercury transit from Nairn, but only a few managed to see the annular eclipse later in the year as, unfortunately, the specially arranged trip was clouded out. Light pollution is of major concern to us and we decided to lobby Parliament about this growing problem. On behalf of the Society, Andy Ferguson and I formulated and submitted written evidence to the Parliamentary Science and Technology Committee about light pollution in our area. We also asked our members to write to their MSPs, MPs and local Councillors to voice their concerns. National Astronomy Week in August was extremely successful, attracting nearly 200 members of the general public to our observing facilities. Many were eager to see Mars as it made its closest approach to Earth for over 60,000 years. A Primary school and Scout group were given talks.